The World Bank and partners are providing funding, logistics and technical support to the three most affected countries. Yet, new infections are doubling, and more people are dying. The problem is that, “we have still not been able to break the chain of transmission”, a senior government official in Sierra Leone said. Three key challenges remain; inadequate Logistics, resistance to behavioral change and inadequate technical expertise. Logistically, health workers still need mobility, among other things to be able to respond effectively. Contact tracers, surveillance and burial teams are key in breaking the chain of transmission. If there is a sick or a dead person in a home, but the ambulance or burial team cannot get there in time, it puts family members at serious risk. The surveillance team and contact tracers should be able to quickly identify and place all those that may have come in contact with Ebola patients or dead bodies, under close observation. Augusta Vandy – aged 15 years, died of Ebola at home in Wellington near Freetown on 18th October 2014, two weeks after the death of both of her parents. She had been taking care of her two younger sisters, one aged 9 years and the other just 5 months old. On the 14th October 2014, an ambulance was called for Augusta who had become ill; and each day during that week, multiple calls were made to the helpline by NGOs, family and friends, requesting transport to take Augusta and her siblings for tests and treatment. On 16th October 23, 2014, as her health worsened, Augusta decided to pass the night in the veranda, as she was worried about infecting her sisters. Augusta died on Saturday, 18th October 2014. The ambulance finally arrived on the afternoon of the 19th. Reports say there were 57 people waiting for an ambulance in the Western Area on that Saturday, and that the service could not respond to all of those emergencies. So at Augusta’s house in Wellington on the morning of 20th October 2014, was her 9 year old sister struggling to take care of her 5 month old sibling, who was now showing signs of fever. Distraught family and friends stood outside the house giving advice and support, but afraid to enter. Zahiyer, who has been in direct contact with the family, told me that the children (the 9 year old and her 5 month old sibling) were still at their house, quarantined as of 21 October. Weeping over the phone, Zahiyer said; “Nobody needs an extra brain to know that these two kids could also have been infected, it is only a matter of time before they start showing Ebola symptoms. Must we wait until it is too late for these innocent kids”, she whimpered. Fortunately, on Tuesday, 21st October, 2014, Zahiyer confirmed to me that the two traumatized girls had been picked up and taken to the Connaught Hospital, Sierra Leone’s main referral hospital. This morning, she informed me that the girls have tested negative. Apart from the Vandys, there are other instances – a patient reported with his pregnant wife to a clinic on Wednesday, October 15, 2014, they were held at the clinic, their samples taken and sent to a lab. The results didn’t come out until Friday, October 17 2014. On Saturday, the husband died. The wife suffered a miscarriage; she is still battling for her own life at an Ebola treatment center. This horrible situation forcefully shows how the weaknesses in the country’s health sector, are hindering the fight against the Ebola outbreak. There are only about 5 labs testing for Ebola in the whole country; necessitating the transportation of samples and patients to the few testing and treatment facilities. This, in itself, has its own risks. 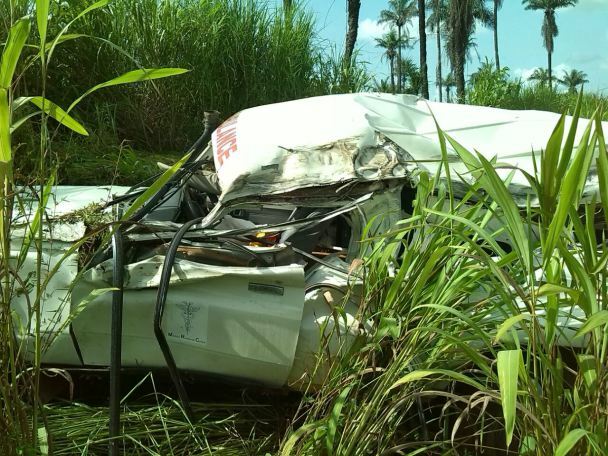 Yesterday, 23rd October, 2014, an ambulance carrying samples from suspected Ebola patients in Makeni, Northern Province, crashed onto another vehicle. The ambulance was heading to the Kenema laboratory in the Eastern part of Sierra Leone. This is the second time an ambulance has been involved in a road crash. 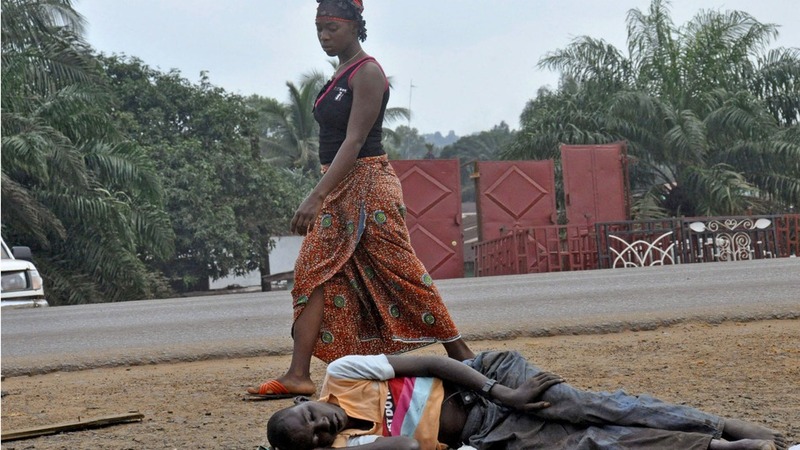 The first was carrying confirmed Ebola patients from Tonkolili, also in the North, to the Kenema treatment center. The fact that samples and patients have to be transported across different parts of the country for tests and treatment, underscores the pain some people have to endure before accessing any treatment. Their samples have to travel first. Then after two or more days, the patients will now have to take the same journey as their samples over long distances. And that is, if they are lucky – some have died before the results from laboratory tests returned. This awkward situation speaks volumes about the difficulties our gallant health workers are facing in fighting this Ebola monster. It reinforces the urgent need for more laboratories and treatment centers across the country. For families, it’s torturous to wait for 2-3 days, watching over the deterioration of the health of a father, a mother, a child, or husband. In desperation, some families have gone ahead and cared for their sick or buried their dead only for the result to come out later and, unfortunately, confirming Ebola as the cause of death. Lack of feedback in good time and the absence of effective structures to tend to the dead, while the family awaits the results, have contributed to new infections. People in quarantined homes face similar heartbreaks. They have to show symptoms of Ebola before any action could be taken. But Sierra Leone’s Chief Medical Office (CMO), Dr. Brima Kargbo, told me that family contact with the sick and dead must stop, because “the predominant mode of transmission is from person to person through contact, especially burial practices”. Dr. Kargbo went on to say that, “Standard Operating Procedures have been developed and if followed by community members, the spread of the virus will be slowed down”. The CMO assured the public that the Ministry will continue its community engagement, and he urged the general public to assist in educating the people of the risks associated with traditional burial practices. However, observers say that, pathetic situations like the Vandys’ need much more than just education; it requires the world community to redouble its efforts in helping the beleaguered countries save their people. At the World Bank Round Table meeting on Ebola on 9th October, 2014, President Ernest Koroma made specific requests; Sierra Leone needs more holding and treatment centers, more laboratories, more ambulances and hearses and more expertise, more of many things.